In Bloom - Nekaro & Co.
Our little garden didn't do much in the way of an actual garden last year. Despite my best efforts, nothing grew. This year I decided I wanted to turn that little spot into a butterfly and bee flower garden. I ordered zinnias, a huge wildflower mix, gladiolus, and daylilies. I love zinnias and daylilies. I'd have a whole yard just full of those if my husband would let me. It was pretty late in the Spring, beginning of May, before they arrived. We planted the daylilies in front of the house. They had already sprouted in the packaging so I wanted to get them in the ground pretty quickly. Honestly, I didn't expect much from them this first year because it was so late when I ordered them. 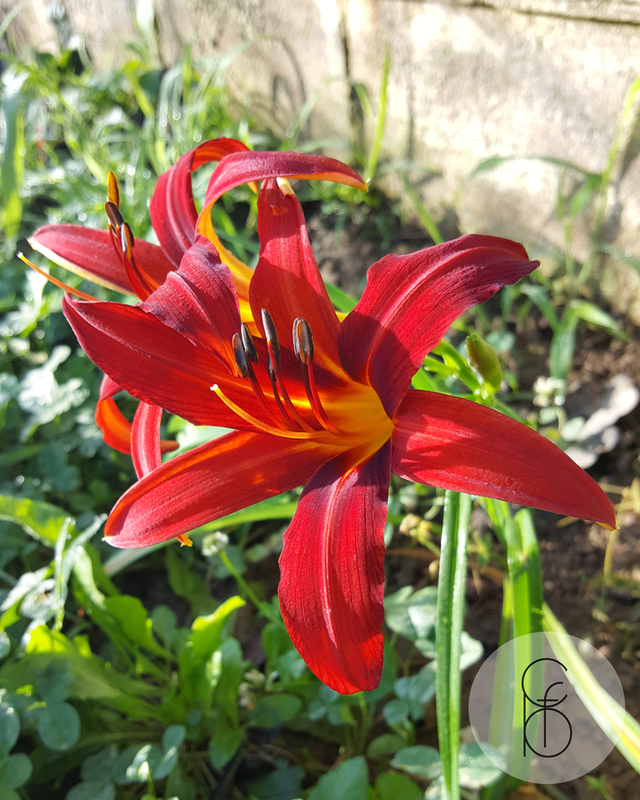 Saturday I woke up to two beautiful blooms on one of the Crimson Pirate daylilies! I'm used to seeing the pretty orangeish yellow daylilies that line the sides of the road everywhere around here, but these... WOW. The plants are still really small and none of the others even look like they are thinking about blooming any time soon. I can not wait to see what they look like next year! The gladiolus are pretty tall now, but they haven't bloomed yet. Unfortunately, I didn't follow the directions on the zinnia and wildflower mixes. Rookie mistake. I thought because the ground was pretty moist and the the weeds were at a minimum that I didn't have to till up the ground first. Trust me when I say, follow the directions. None of the flowers came up. Not a single one. I'm so bummed. I am already making plans to do a better job next year and get a beautiful little flower meadow growing in my backyard.